Find My Workspace lists over 95% of the executive office suites market in Cambridge (Massachusetts). Simply click Request Quote to check pricing for one office, or Add to Basket for multiple offices. A premier coworking and office space designed by entrepreneurs, for entrepreneurs. This centre allows startups, freelancers, and emerging companies the ability to work from a shared office space where all the little things are taken care of. 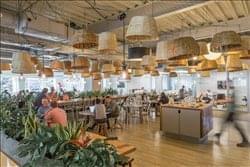 Centrally located in Kendall Square, these intelligently designed offices are for startups and entrepreneurs who know that the key to success starts with a superb work environment. From unlimited snacks and coffee, to ping-pong and 80 inch big screens, in addition to a flexible work schedule, our office is the place to be! And of course, what kind of innovation hub is without free beer!! This is a 15,000 square foot entrepreneurial hub, where teams and individuals grow their businesses, in a collaborative, supportive environment.